This is such a fun project, and it makes a wonderful gift! 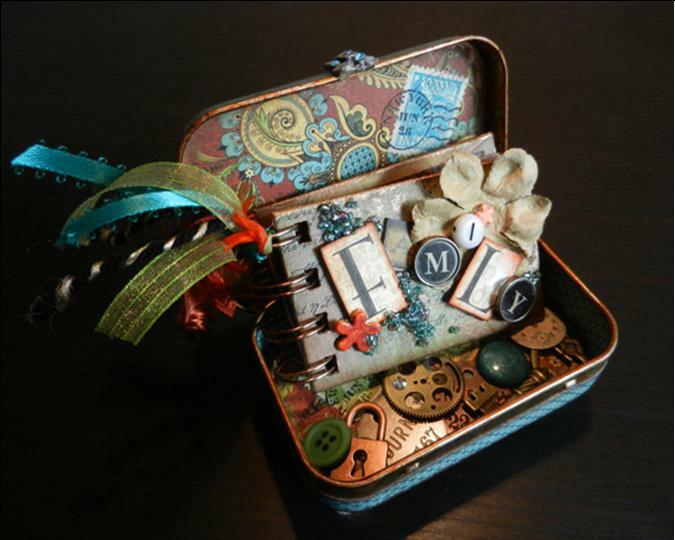 It’s an altered tin containing a mini book that you can customize however you like. In the sample pictured, I spelled out “Family” on the cover and featured different family members (of my mother) on each page: her parents, siblings, spouse, kids, and grandkids. The mini book fits inside the tin. Both are decorated and embellished using your choice of papers, fibers, and embellishments. Although you can’t see it in this picture, the tin even has little “feet” glued to the bottom: large beads that coordinate with the colours of the tin and mini book. In this 3-4 hour class, you’ll learn how to use alcohol inks (which are considerably different than any paint or ink you’ve ever tried before! ), paper trimmers, and a Bind-It-All machine. You pick out your own colours and embellishments. I provide all the supplies. The only thing you’ll have to do at home later is fill your mini book with whatever content you choose. As always, complete instructions are provided (although you won’t need them when you’re in the class, because I’ll walk you through the whole process step-by-step). The next class will be on Saturday, May 28th from 1-5:00. Tickets will be auctioned off at the North Shore Unitarian Church’s “FundFest” auction on the evening May 7th. Starting bid: $40. Contact me if you’d like more information. . .
HI Debbie, great to hear from you! I haven’t done any teaching for awhile, but I miss it! Sorry you can’t make this class — but Dyan R. will be fantastic! You’ve subscribed to my blog so will hear of other upcoming classes. Happy crafting . . .